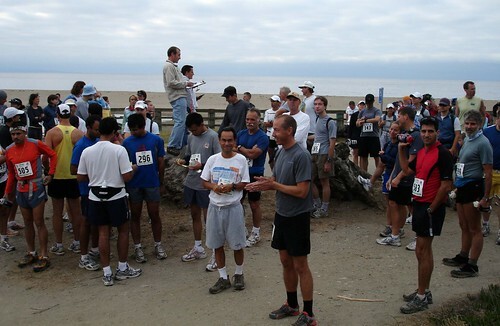 Yesterday I joined 130 trail runners on the beaches of Aptos, CA, for the 2006 Seacliff Beach 14k/22k/35k/50k. I hadn't planned on racing this weekend, but wanted to get a long run in on some new trails. 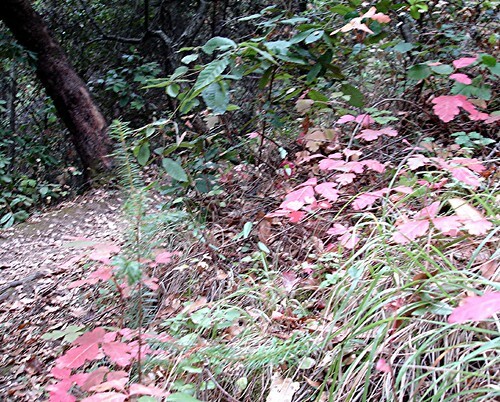 As I went scouring for maps, I saw that Pacific Coast Trail Runs had a race going from the beach right up to the hills and redwoods of the Forest of Nisene Marks State Park. A wonderful trail, so why not sign up and race! I grabbed my gear and headed down Hwy 1. By the time I got there, my heart was set on the 50k. 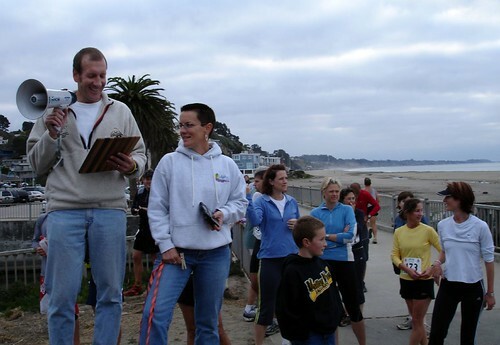 The weather was perfectly overcast in Aptos, CA, as runners from California, Oregon, Massachussets, and one or two from China and India began their warm up. 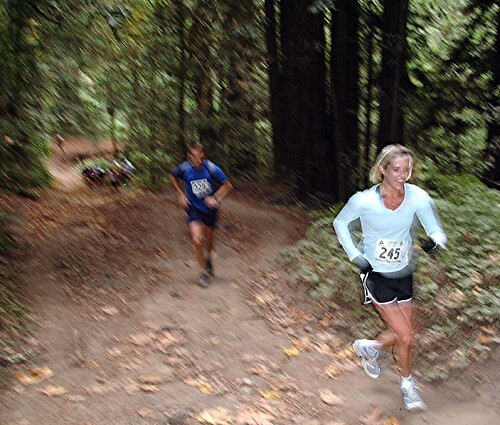 Some of them had just raced at Big Basin the day before, but had enough legs for one more redwood romp. I laced up my Inov-8 RocLite 315's, eager to try them out in a race now that I had clocked a few hundred miles in them. The RocLite's are a bit softer than the Flyroc's I had raced all season, but had the same low-heel, lightweight design. I was enjoying them tremendously for training - now I needed to see if they could hold up to 50k. 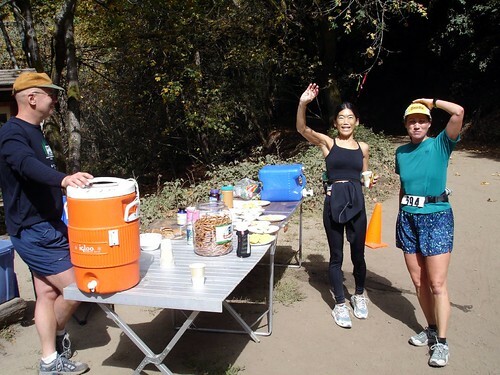 The course was a 4-mile run to the first Loma Prieta aid station, then a series of loops that kept coming back to that aid station. The 50k runners immediately started calling it the "deja vu" aid station, since we would visit it four times before heading back to the beach. The course is relatively flat (3700' vertical change), but with lots of short ups and downs as you weave through the redwoods. At 8:30am, the mass start began and we all headed up towards the forest. I set a comfortable pace to begin, running with David Acosta from Monterey, CA. David is studying for his Master's in a nearby military academy, and was doing the 22k as a warm up for the upcoming Silicon Valley Marathon on October 28th. He had some great stories to share about running in Kosovo, Bosnia, Korea, and other war zones where he had been stationed in the Army. He's led quite a life in his 31 years! We reached the first aid station and stocked up, and learned that Oswaldo Lopez (doing the 50k) and James Hughes (doing the 22k) had shot off the front at a wicked pace. Did Oswaldo know that James was going half the distance? David and I headed up the Loma Preita Grade Trail on the first loop, continuing our conversation about how trail running had helped us both find balance in this crazy world. We caught up to a few more 22k runners on the uphill climbs, and Chris Hacker (doing the 50k) caught us on the downhill. David, Chris, and I (the Camelpak crew) finished the first loop comfortably and restocked on food. David headed back to the beach to finish the 22k, and Chris and I started on the first of two 13k loops up to the West Ridge Trail. I charged hard up the first hill, and after a quick sprint through a hornet's nest (two stings), found myself alone with the forest. 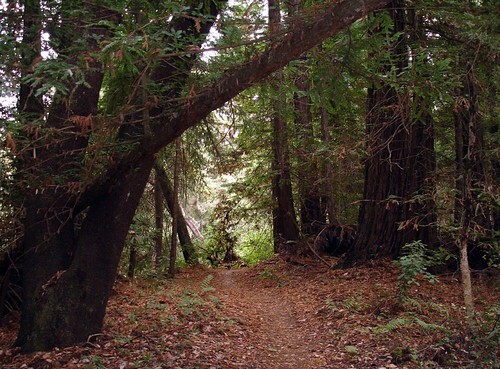 The first growth redwoods created a towering canopy that kept the trails soft and lush. No iPod needed on this run, that's for sure! Both times that I ran through a clear spot, the butterflies flew along with me. It felt almost too serene; perhaps life with a newborn has given me a new appreciation for peace and quiet. I charged back up the West Ridge Trail for loop #3, feeling energized from the Coke. The hornets got me again (6 stings this time), prompting me into the fastest fartlek I had done in months. Christine Miller and Donna Yee were coming down the other way after inadvertently extending their 35k by an extra 10k, but they were smiling and having a good time. Since I was familiar with the trail this time around the loop, I went a bit harder. I was in the zone, and my runner's high was giving me that warm fuzzy feeling. 50 minutes later I finished the loop, about 3 minutes faster the second time around. It was at this point it dawned on me that I had been negative splitting this race, and had about 9km to go. If that was true, I could finish in under 5 hours if I kept going hard. How is it possible that keeping up with baby Sophie all night long IMPROVES my times? 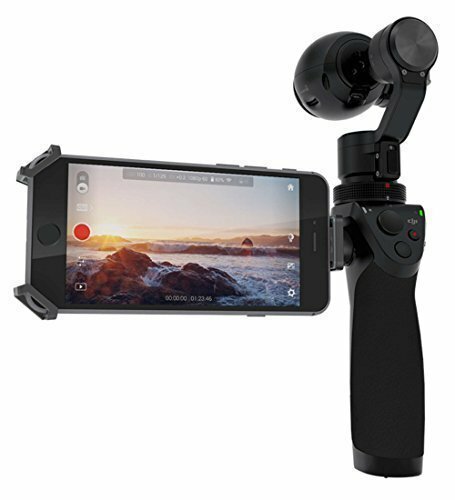 I put away the camera, ate some Clif Bloks, and charged through the last 2km loop and back towards the beach. I went hard enough that my calves burned, although I couldn't tell if that was hornet stings or lactic acid. The downhill guided my along at a 7 min/mile pace. With the beach in site, I came down the finishing chute in 4:56:56, good enough for 2nd place. Oswaldo Lopez had crushed the course record in 4:17:23, pacing James Hughes along for a course record 22km finish (1:44, 20 minutes ahead of 2nd place). Julie Bramlet set a Women's course record in the 35km with a 3:13:46, good enough for 3rd overall. Trail Runner Mag Trophy Series contender Adam Blum won the 14km race in 1:00:07. Overall, everyone was making good use of the ideal weather and well-marked course to push the course to its limits. Leo DeAvila (an Ironman triathlete based out of Los Gatos) and Chris Hacker came in shortly after me for the 50k, with Stephanie Hiller winning the women's division about an hour later. We ate up soup, chili, and plenty of snack foods as we watched the families play on the beach. My legs looked like hell from the hornets, but they felt good and held up to the finish. The RocLite's did well, and were cushy enough to go even longer. It was an epic day! My thanks to Wendell, Sarah, and the PC Trails volunteers for putting on another great race. 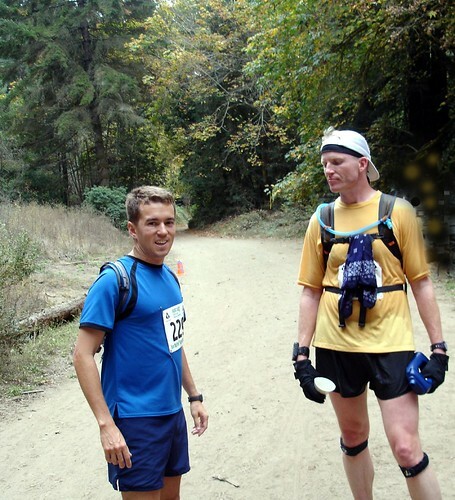 I hope to see you at the Woodside 50k in December! Those trails look beautiful. I haven't tried anything over 10mi yet; I didn't know that there are food stops in the bigger races. Did anyone else get stung? You are so modest! You finished within 3 minutes of the previous course record!! Way to go Scott!!! scott, how has your flyrocs held up? i bought a pair a couple weeks ago, and after 20 miles they started to split and fray along the top of the ankle. i am pretty bummed about it. i didn't know if i got a bum pair or if this is a common design flaw. That sounds like a bad stitch. I've never had it fray at that spot in 20+ pairs. I would take them back and get a new pair (let me know if you have any trouble with that). Usually my Flyroc's last about 300 miles, and I toss 'em because (1) they smell horrible, or (2) the blue nylon frays after catching on one too many sticks. I had one bad footbed, but got it exchanged easily. The RocLite 315's have a similar feel to the Flyroc's, just a bit softer in the heel, and not quite as fast on draining. I really like them. I heard that about a dozen people got stung, all around the same spot on the course. I hadn't mentioned it, but the aid station folks were making sure nobody was allergic and had figured out an alternate route for those who didn't want to brave the nest. Best of luck at the JFK50! I hope Seacliff was a good warm up, even though you had to cut it short. I think the RocLite's would do well in a 50 miler. My feet felt great after the Seacliff 50k. 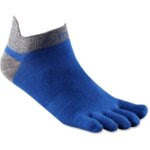 All Inov-8's are "minimalist" in design, so they don't have a ton of padding (which I personally prefer), but the RocLite's are the softest among them. I run the 315's every day now. That being said, I don't have a trail 50 miler on the agenda anytime soon. You'll have to let me know how they work out! 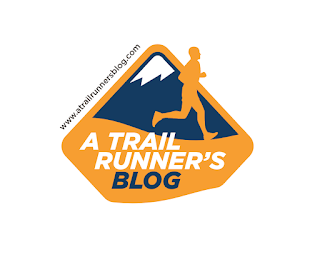 have not dropped any comments in a while...but never-the-less still have been checking out your blog very frequently and it's still EXCELLENT, especially your race reports! Scott, congrats on your second place and a great race report. While I'm not a fan of loop courses, your description makes this one sound like a blast. What's up with the hornets around here lately? I have been stung in each of my last 3 ultras, Santa Cruz 50K, Big Basin 50K and Firetrails 50M!!! 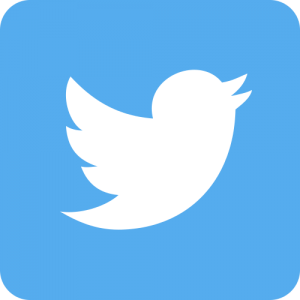 Your blog is exceptional, particularly the interviews, I think I'm all caught up...great stuff.